Actor Ali Fazal and his girlfriend Richa Chadha, who are currently in Los Angeles for the upcoming 90th Academy Awards, didn't plan to get their selfie photobombed by none other than 'Jack Dawson aka Leo'. Ali shared a selfie with Richa Chadha from the pre-Oscars bash and wrote, "Ok I swear I didn't plan this photo... hahahahahahahahah... but Jack Dawson aka Leo seems to have photobombed this selfie... spot if you can.. but besides the little crowd, it was an honour to be present at the WME Party last night.. with greats in the room..." The actor also quipped about the fact that he stared right back at rapper Drake, who had been eyeing Richa Chadha. "Stared back at Drake because arey woh richa ko taak raha thha.. toh maine bhi ghoora," Ali added in his Instagram post. Ali Fazal's film Victoria & Abdulhas got two Oscar nominations, for Best Costume Design and Make-up and Hairstyling. The pre-Oscars bash, particularly attended by Ali and Richa was organized by his agency WME. The actor mentioned it in his post and wrote, "And I guess the reason I was so phaila hua was because it was home territory - my agency throwing the pre-oscar party last night. I think all the hip hop crowd was there for sure." 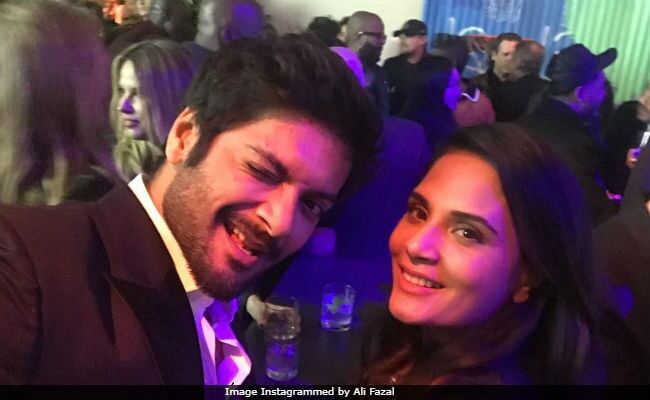 Actress Richa Chadha also shared a video of with Ali Fazal from the pre-Oscars night and captioned it "#AboutLastNight @alifazal9 #Oscar2018 #WMEParty." Victoria & Abdul directed by Stephen Frears, is based on a novel by Shrabani Basu. The plotline of the film revolves around the relationship shared by Queen Victoria and Abdul, who was a munshi in her government. Judi Dench plays Queen Victoria, while Ali essays Abdul. The 90th Academy Awards aren't until Sunday night, but with the looks of it, it seems that the entire Hollywood is already in full swing. The 90th Academy Awards will be held on Sunday night (early Monday morning in India) at the Dolby Theatre in Hollywood, Los Angeles.